6 weeks ago we had a new gas dryer delivered. We hooked it up to the existing gas line where the previous gas dryer was and made the silly mistake of thinking we were good to go ahead and start using it. Au contraire, mon frere (literal translation: Hell no). According to everyone else in the free world who's ever hooked up thier own gas dryer (my father) - it was a piece of cake and just about impossible to screw up. Heavy Machinery and highly flammable, combustible material - what could go wrong? So we lit our cigarettes and got started. Just kidding. My father didn't seem to be amused, either when we texted him a picture of Brian kneeling down next to the gas pipeline with a wrench in one hand and a lit cigar hanging out of his mouth. The best part is that my dad takes everything very seriously, so no matter how outlandish the joke, he automatically gets wound up thinking he has to save me from myself. Needless to say, I got a phone call with a lecture about the dangers of natural gas and the hazards of smoking. I told my father not to worry, as we had cracked a window and only smoked filtered cigarettes, which are proven to be much safer than unfiltered. That's $114 more than we were looking to spend for for 15 minutes, but we were still smelling gas (even after we shut the line off), so we pretty much had no choice but to call them. Here's the thing about the gas company.....when you call them and mention that you tried to hook up a gas appliance on your own and you believe you now have a gas leak, they take it pretty seriously. Especially when they find out you're smoking. They actually come out for free when there's a suspected gas leak involved to secure any immediate dangers. Oh good! They were quick,too. Almost like they have a unit on hand just waiting for people like us to try and "do it oursleves" so they can dispatch the dummy-mobile to save us from ourselves. As it turned out, we had a bad gas hose - so it wasn't actually our fault They made sure the gas line was shut off, told us to get a new hose (or we could have them attach the hose for a mere $500) and then they'd come back to inspect it to make sure it was ok to turn the gas back on. Ok - so the hose at Home Depot cost like $30 and it was simple to hook up. That was the easy part. Now we just had to call the gas company and schedule a time for them to pop by and turn the line back on. Here's the other thing about the gas company. When you call the main number and press #1 for "I may have a gas leak and I'm not sure if I should put my cigarette out", someone answers immediately. But when you press #2 for "I haven't paid my gas bill because I spent all my money on tobacco products and cheap floozies" or #3 for "I need to have one of your field workers come to my house and inspect our stupid mistake"...they make you wait. Estimated wait time was 21 minutes, and we waited on hold for 35. When we finally got someone on the phone and explained what we needed, she put us on hold for another 20 minutes while she finished her lunch. She gave us a date like 10 days out and that was that. Here's another thing about the gas company - they don't know how to use a calendar, so the nice gas man showed up at our house the next day - a Saturday - of Thanksgiving weekend, no less. We weren't expecting him. Brian was out getting a hair cut, actually. So I answer the door in my pj's. The dog was jumping all over this guy - house was a total mess. But what was I going to do? I needed the gas line turned back on ASAP, as I was sick of spending my afternoons drying the clothes at the laundry mat with Margie and Bertha watching Judge Alex reruns. There's a whole subculture at the laundry mat, but I'm in no condition to go into that now. Anyway, I wasn't quite sure what I was talking about, and called Brian several times to no avail - so I'd have to go this alone. The gas guy was in a hurry and didn't seem like he had much time...so here I am trying to move out the dryer and explain the whole situation and he's seeming like he might just say something like we'll have to call back and reschedule which I just couldn't bare the thought of, so I figure I'll try and be cute and clueless and see if maybe he'll feel bad for me and wait. But then I glance down at my outfit and realize that I'm in 6 layers of PJ's and "cute" was just not gonna happen. 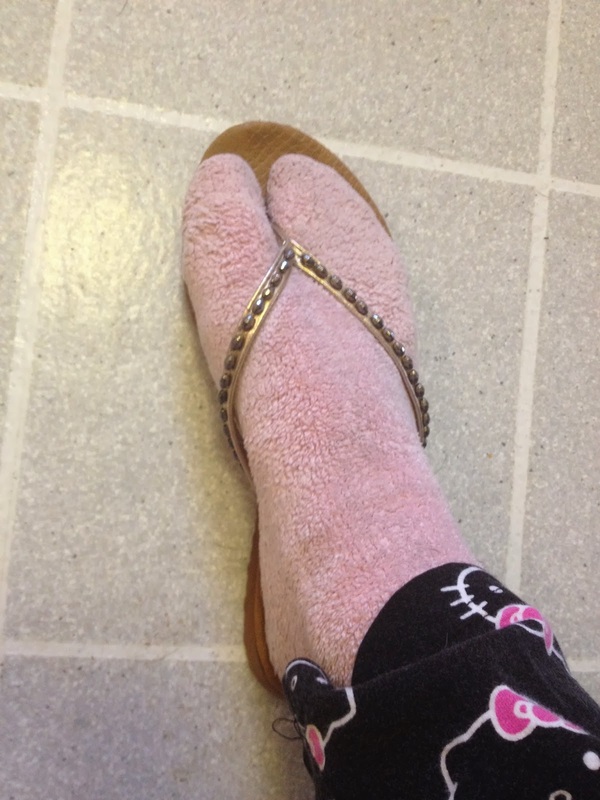 In fact, I had socks on with flip flops. I'm not making this up. SOCKS with FLIP FLOPS, people! Yes, this is what I was dealing with. What is seen cannot be un-seen. I think ultimately, the guy assumed I was on a weekend pass from the asylum and in the interest of not having me run around town with wet laundry in such a state, he waited it out and finally turned our gas line back on. So I'm thankful for that. The moral of this story is never to wear socks with flip flops- even in the privacy of your own home, and of course the other moral is to always buy filtered cigarettes....obviously.